Unilever International has laid a foundation stone for the construction of a multimillion-dollar tea-processing factory in Nyaruguru District, Southern Rwanda. The factory, to be completed next year, is part of Unilever’s US$50 million investment into two large-scale tea sites in Mata and Kibeho sectors of Nyaruguru District. Unilever’s CEO, Paul Polman and Agriculture Minister Dr. Gerardine Mukeshimana presided over the launch. Polman said that Unilever chose to come and invest in Rwanda after he met President Paul Kagame in September 2015 in New York. Uniliver is a world’s leading supplier of food, home care, personal care and refreshment products with sales in over 190 countries. In May 2016, Unilever signed an agreement with the government of Rwanda to invest over $30 million over the next four years in developing the two large plantations of Kibeho and Munini. Munini tea site project covers 318.8ha while Kibeho’s is on 498 ha area. The project affected 735 households who were reimbursed accordingly or chose to relocate to 98 modern houses constructed in villages in Munini and 130 houses for Kibeho sector. 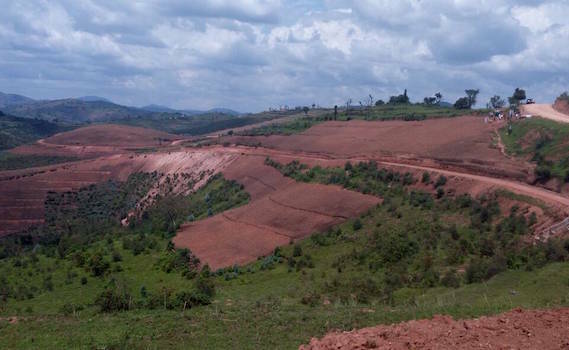 The project will see around 1000 jobs eventually created at the two sites and already the population who relocated to the two villages [in sectors of Kibeho and Mata] has started ripping fruits from the project. Modeste Musirikare is a resident of Kibeho sector, whose land was bought for the tea plantations in the project. He says that his life changed when he and his neighbours relocated to the clean village they call ‘New Jerusalem’. “Now, my family lives a better life. While I requested to be grouped in the first Ubudehe group (for the least privileged citizens in Rwanda), but now I would not be in good terms with someone wanting to put me in that group”. “I access clean water, electricity and any kind of development one would wish,” Musirikare said, adding that, “Due to wages I get from tea plantations, now I can access loans and do projects to develop myself,” he proudly accounted. Meanwhile, Uniliver CEO said the project is further demonstration of Unilever’s commitment to a long term sustainable business model that creates value and shared prosperity. Currently Nyaruguru tea plantations, processed in three factories, on the area of 5337 produce 3900 tons yearly according to the Mayor of Nyaruguru District, François Habitegeko. The long-term investment by Unilever will finish having constructed a factory that will see tea production of 10,000 tons from 2018, per year. The tea factory will be operated on 4231ha area, with 3415 belonging to the local farmers and 816 ha owned by Unilever. Introduced in Rwanda in 1952, tea is Rwanda’s main cash crop and according to National Agricultural Export (NAEB), its production has increased steadily, from 60 tons of black tea in 1958, 1,900 tons in 1990, 14,500 tons in 2000 and reaching at a peak of 24,800 in the year 2014.